As we uncover all the 3D illusory veils, transitioning into a Higher Octave, looking back into what was/is happening outside ourselves - will not serve us to be aligned with the new frequency that we have consciously decided to integrate, for to be always present within the illuminated presence of our God Self, we must avoid putting all our attention in the reigning chaos that we are envisioning outside. Do not consider the sides, do not look to what is no longer occurring in your New Timeline, pay attention only in your present moment to get all the strength you need to confront your own shadows and emerge into the precious lovelight being that you always were. This is a moment not to ascend, for what we call ascension, is nothing but the descencion of your True Essence and Divine Wisdom into a physical body, but, as this New Moon at 27 degrees of Virgo reminds us, to descend our Divine Power instead of focusing on the "chaos" that seems to govern our Planet, at this time. For Chaos is the way the cosmos have to reorganize reality, one that was obsolete and must be dissolved. What we perceive as being chaotic, is not what IS to the Universe, for we can never understand what is happening in a Higher Perspective. 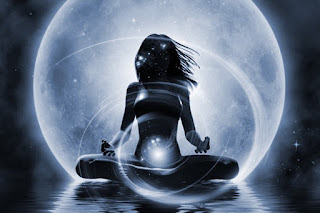 All the planetary events happening now, is not only what Earth needs to adjust or purify herself, as it is already a living organism herself, but the materialization of the dualistic reality, we have consciously chosen. Recently, I received many questions about why all these events are occurring, if we are heading into a Higher frequential space. The guidance I received from my Unified Self (the sum of all aspects, past, present, parallel and future of who we are, for in the Universe there is nothing higher or lower, this is just our limited human perspective) is that as we move into a New Space/Timeline, of more unity, the more we need to destroy and work with the unification of both polarities, that still reign our Universe and as it is within, will be in the macro as well. With this New Moon in Virgo, we are being invited to work on purity, personal power, selfless service to others, and especially in descending this Light that we are from our I AM Presence into our tangible realm, where we dwell, where we are ascending physically and where we should anchor our unique Essence and spread this spark to All. Recently, I was told by my companions (Guides), I must accept a certain situation, I was seeing in the physical, as it IS, even if it is against the Law of One, instead of being constantly trying to change it, for all has a purpose within Creation. Everything, even if it seems negative to my human self, is required for us to remember what unity is. We cannot change what others do, for we all were given the gift of free will to being with, we can only change our own frequency and decide where to focus. Appreciating everything that happens, as a cosmic reminder of our true nature, is the key to understand why even the dakrness is essential, for we could not experience what we are not, if it was not for the dark aspect of this Universe that also resides within us. All is equal, even though we do not see it as such while we are humans, everything serves the Forces of the Light, for everything is Light. This shall never be judged. Why would we judge the Universe and the way it helps us to remember, from a limited view? Only acceptance of what IS and the humility of recognizing that we know nothing of what is truly unfolding within the Divine Plan, will help us understand this tumultuous time we are experiencing, knowing, that everything is already perfectly orchestrated, and that all serves a Purpose, which is essential for unification to occur. Nothing and no one is there in your life by chance, nothing and no one is evil in nature, for everything emerged from the same Source. All is there to bring you awareness, Truth and remembrance. At a cosmic level, we are ruled by Earth and Mutable energies, for we have on one side: The Sun, The Moon, Mercury, Venus, Mars, and Pluto in Capricorn in Virgo, an earthly sign, and on the other hand, we have Virgo, whose essence is mutable, Saturn in Sagittarius, and Neptune and Chiron in Pisces, another mutable sign. This is another message for us to bring all the flexibility and intuition that we obtain in our inner realms, as well as creativity - magnified by having Neptune opposing Mercury at the time of The New Moon - into our tangible plane, for it is there where we can enjoy what we can only envision and nurture from within. The earthly sign of Virgo, which is ruled by Mercury, is associated with the Virgin Archetype, which is by no means related to celibacy. On the contrary, it concerns the Divine Feminine Archetype of wisdom, purity and wholeness - nurturing and loving everything she touches; in the physical. Virgo likes to serve humanity which is what gives Virgos joy and purpose. It is essential that during this transitional time in which we are finally bifurcating from 3D Old Earth, we act as the light conduits that we are - grounding our essence and love within Earth, instead of just living in the ethereal, for it is only by creating strong foundations that we can reach the Heavens. At this phase of our journey through New Earth, many of us are experiencing different sensations, due to the natural process of leaving more density aside. Some of these sensations may take the form of intestinal issues and /or anxiety ones, between many others such as tiredness, heart palpitations, especially withe the waves we are receiving lately from our Central Sun, and many others that will be unique for you and your soul mission. Virgo rules our intestine, it is where purification takes place, and as well as we are seeing in the macro, with the intense transformation Earth is having, the same is happening within ourselves too, we are experiencing a deep purification to be able to re-birth, again, into a new Octave. The anxiety, comes from our heart’s center, especially if we have been - or are still working with - healing old traumas, the removal/dissolution of them, makes our heart’s center experience a deep sense of longing and attachment. Let it all go, embrace whatever feelings may come to you and know that this is your entire body releasing old addictions. This is one of the main reasons why it is so important to commune with Mother Earth now, for nature heals and purifies us, naturally. As we also have the Moon opposing Chiron, the Cosmic Healer, as I call Him, with Saturn, squaring both, at the New Moon Time. Old feelings can emerge now, they are sending you a message: they would like to be embraced, heard, accepted and released. Listen. As we also have Jupiter, the Planet of Expansion, opposing Uranus, the Planet of Change, this is a wonderful time to use the frequency from mutable energies that surround us now, and use them to liberate ourselves from our fear of change, adapting to any condition that the unknown could bring. It is only when we are flexible, in perfect flow with All, and at peace, by trusting in everything we have created and that our God Self has orchestrated for us, that we are always heading into the right space for us to experience what we came here to remember. Do you really wish to move on and step into a Higher Space but you feel that you are leaving something/someone behind? Do you still dwell in the past by remembering it as a better time? Do you trust that you left behind all you should and embrace this cosmic transition with love and joy? Or do you talk about it, read about it, but are not yet aligning with this New Frequency, due to your old attachments? When we dwell in the past, we are creating an addiction to situations and people who are not the same now and which are happening in another space we are not occupying now. When we do this, we are allowing these past events to block what is meant to touch our lives now, for we are creating an energetic wall against all odds - residing in fear, in impossibility and in illusion. It is not by others or by what is occurring, at a planetary level, that you are not yet where you wish to be, between other things because this is not a race and there is not a place of destination to reach/go. If you are not yet experiencing at least the bliss of seeing all the inner work you have been doing, it is because you are impeding it yourself, not the outer chaos, not the energies doing anything to you, energies simply are, we integrate them and we choose how to use and direct them. If you are not yet in the space you would like to dwell, observe, instead of judging. This is about compassion, this is about joy, about seeing all we have achieved, if we are doing all we can. This is not for us to want to be or do more, for it is not about acting or wanting but about BEing. Compassion is first applied to the self for it is by recognizing within the Divine that we can also recognize and act as such, with others. Virgo’s New Moon arrives to remind us of the importance in purifying and grounding our essence within our physical plane, in tandem with our soul desires and new projects for the following months. This is a cosmic blessing for us to be of service, not just to the self, but to All. How? Not by dwelling in the past or future, or in what seems to be wrong in the world, but by shining our unique spark, and being present in the Now, where all our strength and energy resides and where all true power exists. Use it to create strong foundations that will support your desires in the tangible. This is a wonderful time to purify, beginning not with our bodies, but with the feelings we still hold within that make us fall into old patterns, impeding us to feel the bliss of what living in the now is. This is not a time to believe we are not ascending, simply because certain areas of the Planet, and certain aspects of our old self, are vanishing/shifting. For if we truly desire transformation, a reorganization is required to bring the change we so wish to see, in the physical. This is not a time to dwell in fear, but in possibility, in acceptance, in joy and in love with All. Do not judge the Universe, in what it is doing, the question is: Do you? Do you know what you are doing with your energy and intention? Where to put it, how to use it. Are you observing if, even in the most challenging times, you keep choosing to stay centered into your heart? Or do you want to be and do but when all seems not occurring according to your own human desires, you lose all faith, dwelling again in lower frequencies? There is never a time to abide in fear, for we only should embrace it for a while, and then let it all go, by only holding the wisdom this brought us. When you choose to experience fear for a long time and make it your natural state of being, then, you will also being to manifest the things, situations and encounters that are vibrating at the same frequency - opening a doorway in your energetic body for manipulative forces to enter. Yes, Beloveds, Truth shall be told and understood instead of manipulated, we do not have to focus just on this side, but denying it will not serve us, at this transitional phase. It is essential that we begin to understand the cosmic battle that is already strongly felt, at this time, of our ascension journey, to regain control of humanity. Forces disguised as light, forces that seem to be working in your favor but then, they are just manipulating you and your will. There is nothing to fear, fear comes when we are ready to confront the aspects of us that are yet dwelling in separation, and hence, pain. It is a message from all these aspects of us, of assistance, they also desire freedom - as you do - from pain and illusion. Purity comes when we finally are ready to dissolve all these hidden aspects and lower layers of our 3D self and begin to embrace our True Essence. By fearing you cannot descend your power - Light - by fearing you can only cover it. This is a wonderful time to do so. It is a unique and precious moment for you to finally choose, not by simply agreeing, reading, etc, but by BEing and acting, at every single moment, as you think and feel. It is your choice - as always - to choose where you desire to sojourn, if in the bliss of being free and finally releasing an old self and life, or in the fear of losing the familiar. As there is not a fixed and linear time for you to make a choice, you are free to join the ones who have already taken this step, at your own pace. The question is: Do you really wish to repeat the same old scenarios that led you into a space of unlove and confusion? Yours is the inner work to move within, in deep communion with your soul, and after reading this, keep choosing to dwell within a higher frequency or choose to fall into oblivion again. The opportunity for you to stop choosing fear, descend your power and reclaim your sovereignty, is forever there for you to take. I wish you all a purifying, and magical New Moon in Virgo, Beloved Companions!